The One Piece Portrait of Pirates figure range goes from strength to strength it seems. Whilst many figure ranges last for a limited time then get replaced by the next big thing, the Portrait of Pirates range has not only had regular new releases but has seen many of the earlier figures re-issued. It has even had spin-off lines, of which the Excellent Model Mild range was one. The Mild range depicted the One Piece characters as children, using their origin stories from the anime and manga as inspiration, but after nine child figures (plus one of reindeer Tony Tony Chopper) the range has ended. As a swansong for the Mild range Megahouse have released an alternative version of one of the figures, ship historian Nico Robin. The previous Robin Mild range figure depicted her standing up clutching a book in front of her, but this one has her sitting down hugging her knees. As such it is shorter then the previous figure (although it is in the same scale), but as always it comes fully assembled and painted. Nico Robin from her origin story, and it is called the 'Dereshii version' as she comes with an alternative laughing face - dereshii being an onomatopoeic word for the laughing sound she is making. The facial expressions tie in exactly with the anime and manga, and it's good to see that this new figure gives Robin a darker skin tone that is closer to her Hispanic look in the anime than her previous child and adult Portrait of Pirate representations. second version of an existing figure. Why not do Zoro's childhood rival Kuina? Or Usopp's 'pirate crew' Carrot, Pepper and Onion? They could have done Franky's friend and rival Iceberg, Vivi's childhood friend Koza or the sickly Kara from Usopp's origin story. Even the wannabe marine Coby would have been preferable to re-doing one of the existing Mild figures. I'm not saying that there's anything wrong with this new figure, in fact it's closer to the character than the previous Mild interpretation, but it seems like an opportunity to expand the range has been missed. In the end I suppose it comes down to economics. The Mild range is apparently being retired as it didn't sell as well as the main Portrait of Pirates range, and releasing a lesser known character as its swansong would not have made financial sense. However, as a collector it is a little frustrating. This new figure is one of the best Mild figures to date, but they could have easily included the laughing 'dereshii' face as an extra with the previous figure - especially as they include a second face with each Mild figure anyway. Despite my griping I have to recommend this figure highly, taken on its own merits it's superb and worth picking up over the rarer original. It's another excellent entry in what is already the best Japanese figure range currently available, I may moan about what ifs but it's only because Megahouse have spoiled us with the Mild range, how many other companies release high quality premium figures of characters that showed up in just a few flashback chapters of a manga? If you see it you should definitely pick it up - these Mild figures are unlikely to be reissued so it will only get harder and harder to find...and even more collectable. As with all of the Portrait of Pirates figures a plastic base embossed with the character name (in English) and a relevant emblem is included. The base for this figure has no pegs or indentations to provide more stability though, which makes it pretty pointless from a practical point of view. 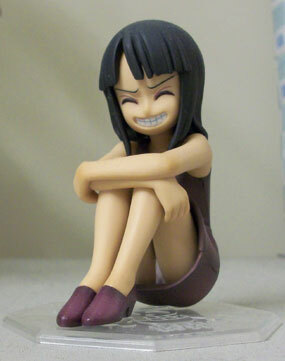 Also included is a secondary face, giving you the choice of having Robin either smiling or doing her 'dereshii' laugh. The faces are easy to swap by just popping the figure's head off and removing the front half of the hair. It's also a nice touch that the neck joint allows the head some limited movement.